In a world dominated by Microsoft Windows PCs, it can take conscious effort to only use Apple Macs. Also, with an abundance of Google Android and Windows tablets available from many companies, it can take a special loyalty to choose an iPad and also a Mac. 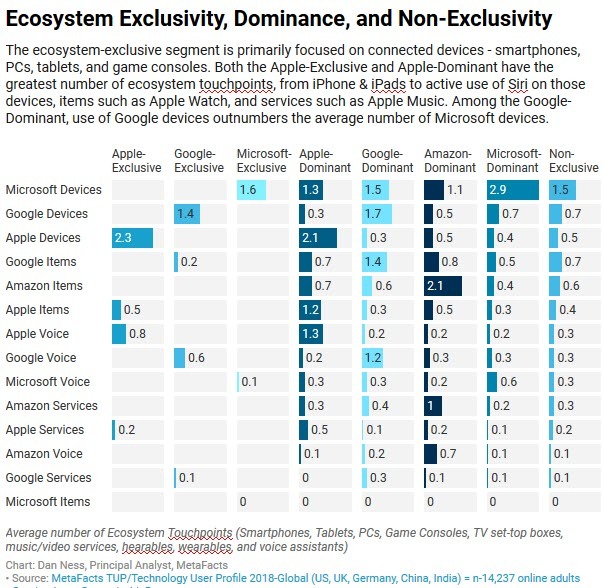 Furthermore, with the widest assortment of Smartphones being from anyone but Apple, it’s a further statement of preference and choice to have only Apple devices. 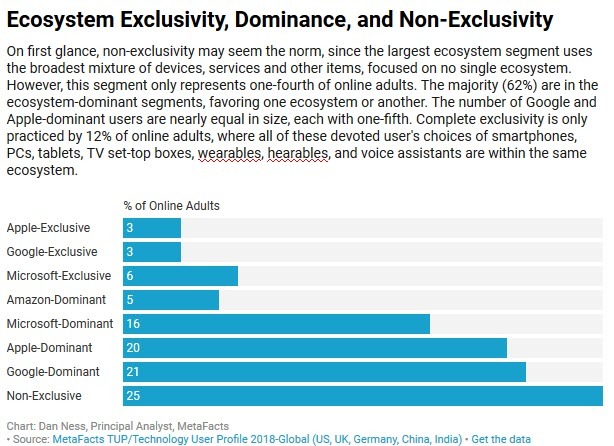 One in eight (13%) of adults with any connected device have in fact made these choices, and are only using Apple Smartphones, Tablets, or PCs, assiduously avoiding Windows or Google Android or Chrome OS devices. Who are these Apple-only users? Are they only the socioeconomically elite? Well, yes and no. They do have higher incomes than the average American. Among adults with only Apple devices, 27% have household incomes of $100,000 or more. This is and index of 137 above the national average for Connected Adults. Many other related answers are part of the full TUP service, available to paid subscribers. The TUP chapter with substantial information about Apple-Only users is the TUP 2016 Devices Chapter. Other TUP chapters detail iPhones, iPads, Macs, and the overall brand footprint. 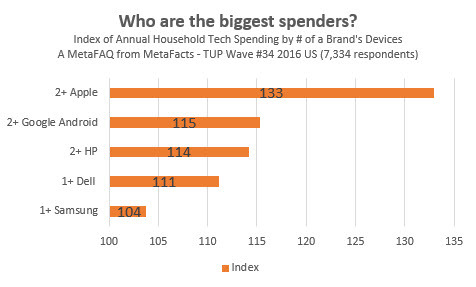 Household tech spending continues to grow. Some brands have managed to attract and retain the biggest spenders, while others have a more pedestrian profile. 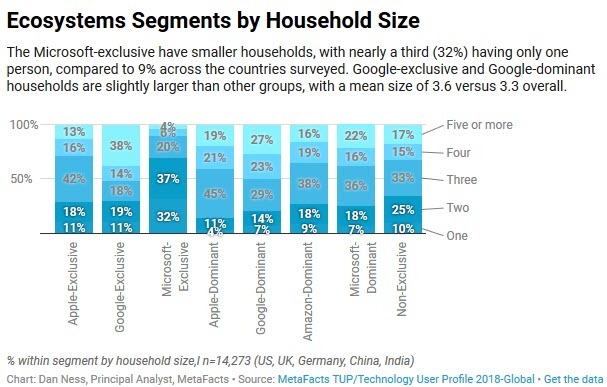 Apple has consistently lead the market in reaching higher-end market segments, whether higher income or bigger tech spenders. Our most recent research shows how much further ahead of the pack they’ve reached. Adults with 2 or more Apple devices spend 33% more on household tech devices and services in a year than the average U.S. Connected Adult. 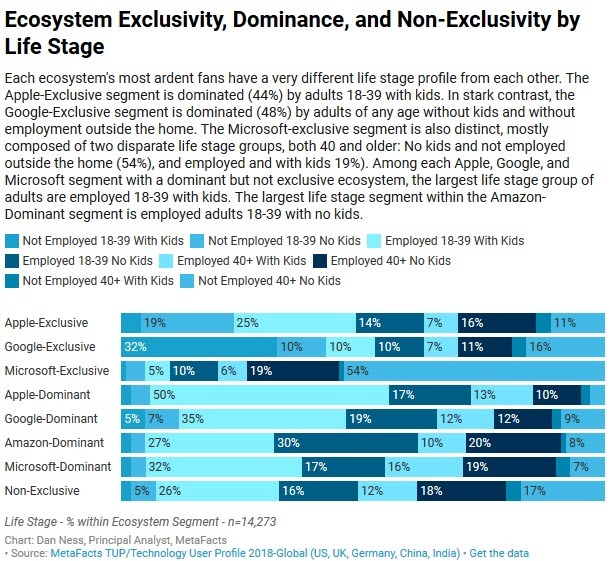 Adults with 2 or more Android devices or 2 or more HP devices also spend more than average, although their index is below half of Apple’s, at 15% higher and 14% than the national average, respectively. The mix of spending is different among HP and Android consumers. While HP’s best customers are stronger spenders on Smartphones, digital content, and Internet connection services. Adults with 2 or more Android devices spend more in a year on devices, especially peripherals, as well as printer ink. Many other related answers are part of the TUP service, available to paid subscribers. The TUP chapter with substantial information about the users of each major brand is the TUP 2016 Brand Footprint Section.